Cmdr. Mark Evans of the Jacksonville Beach Police Department said the swimmer was taken to Baptist Beaches, but is in stable condition. Red flags are up on packed beaches for the Memorial Day weekend, which warns swimmers about treacherous currents and rough seas. "The recommendation is to stay out of the water," Evans said. He said most people are adhering to the recommendation, but some aren't. Jacksonville Beach lifeguard officials said they have been very busy and have pulled several people from the ocean during the holiday. A spokesman said anyone that does get in the water should swim near a life guard station. This story originally appeared on the Florida Times-Union. UPDATE: The missing man has been found, police said. JACKSONVILLE BEACH, Fla. -- Police in Jacksonville Beach are searching for a man reported missing Friday who may be in danger because of a medical issue, authorities said. Derrick Mitchell Roberson, 33, was last seen about noon in Ocean Front Park, located on 1st Street in Jacksonville Beach, according to Jacksonville Beach Police. Roberson lives at a home on Heron Street in Jacksonville. If you see him, please call the police: (904) 270-1661. UPDATE: The boy has been found, police said. JACKSONVILLE BEACH, Fla. -- The Jacksonville Beach Police Department is searching for a 12-year-old boy suspected of running away from school Tuesday afternoon. Ethan Fairley, described as white with blonde hair and glasses, was last seen leaving St. Paul's Catholic School in Jacksonville Beach about 1 p.m. He was wearing a light blue T-shirt and dark navy pants at the time, police said. Investigators believe Fairley is somewhere near Jacksonville Beach and possibly near the San Pablo Avenue area. If you spot him, please call police at (904) 270-1661. NEPTUNE BEACH, Fla. — Two whales have washed ashore on Neptune Beach and will have to be put down, according to Florida Wildlife & Fish Commission. Robert Lent, an officer with FWC, said the sperm whales will be taken to Jacksonville Zoo and put down. We are still working to discover the exact reason for the deaths of the whales. Witnesses at the scene said the larger whale appeared to have bite marks. As more information becomes available, this post will be updated. JACKSONVILLE BEACH, Fla. -- Police shut down a block of westbound Beach Boulevard in Jacksonville Beach Friday evening after a bicyclist was hit by a car. According to the Jacksonville Sheriff's Office, it happened in the 700 block of Beach Boulevard between 6th and 8th streets at some point in the evening. That portion of the road was closed for several hours. The Jacksonville Beach Police Department says a 64-year-old woman was riding southbound when she was hit. The woman possibly rode into the path of the car, police say. The woman sustained head injuries but was talking to first responders on the way to the hospital, police say. The crash is now under investigation. JACKSONVILLE BEACH, Fla. -- Jacksonville Beach police say a days old argument between two men led to one of the men shooting the other at the Seawalk Pavilion last Sunday. 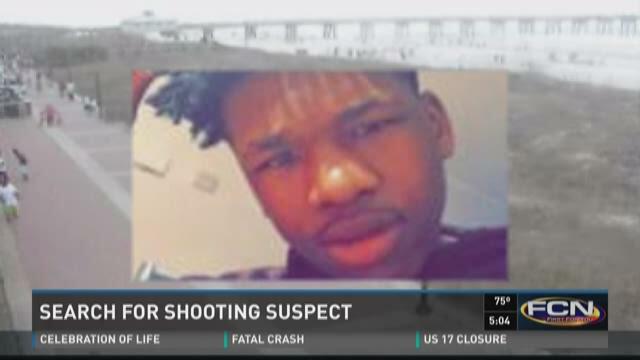 Investigators are still searching for Malik Robinson, 18, the man they believe pulled the trigger on the crowded boardwalk in Jacksonville Beach. "He shot someone in a crowded area. He had a weapon at the time. He should be considered armed and dangerous," said Commander Mark Evans with Jacksonville Beach Police. JACKSONVILLE, Fla. -- The search is on for a Jacksonville Beach man who's been missing for weeks, authorities say. Antonio Porter was last seen on the afternoon of March 6 and last heard from by family March 11, according to the Jacksonville Beach Police Department. If you've seen Porter, please call police: (904) 270-1667.